It’s difficult to know quite where to begin at the end of Day 4 as the 2018 Viana PWA World Cup continues to provide incredible conditions - for not just one but two disciplines. 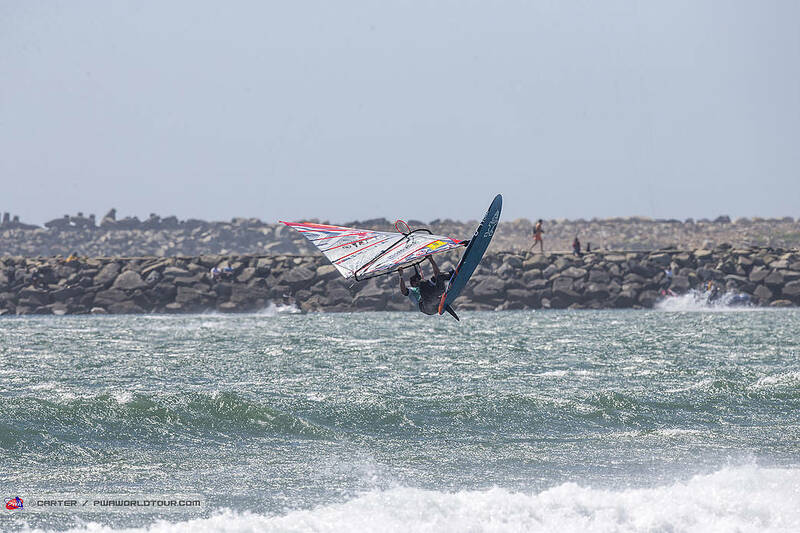 For the third successive day, the wind machine in Viana do Castelo absolutely cranked with winds gusting above 40 knots creating a competition environment you simply couldn’t keep your eyes off… firstly with the second installment of freestyle and then more frantic slalom. After the completion of the Women’s Single Elimination II the world’s fastest sailors returned to action during the afternoon, just in time for the wind to go nuclear as gusts over 45 knots and an increase in swell rattled through the bay to send everyone reaching for their smallest gear. In some heats, things became something of a battle of survival before the wind dropped slightly and became gustier during the early evening. Sarah-Quita Offringa remains Cousin Questel’s closest rival and is still just about in touch after recovering from an 8th place in Elimination 5 - when crashing on the opening reach - by winning a hard-fought final in Elimination 6 as she just held off the searing challenge of Lilou Granier (Starboard / Severne). The women’s top 5 remain unchanged from the start of the day with Lena Erdil (Starboard / Point-7 / AL360 / Chopper Fins) - 3rd - Maëlle Guilbaud (Patrik / Loftsails) - 4th - and Marion Mortefon (Fanatic / NorthSails) - 5th). Erdil could’ve been in contention for a 2nd place, but crashed her opening gybe when leading the last race of the day and had to settle for 7th. Fellow New Caledonian - Océane Lescadieu (NeilPryde) - also deserves a mention for somehow hanging onto a 6.4m for the entire afternoon, while the majority of the guys were on smaller. The 22-year-old was prominently placed in several races, but then understandably became overpower at gybe marks to miss out on the Winners’ Finals. The PWA would also like to wish Sarah Jackson (RRD / Maui Ultra Fins) all the best after the 20-year-old was taken to hospital during the afternoon - the extent / seriousness of her injuries are not yet know, but we wish her a speedy and successful recovery. However, it is Iachino who is now in total control of the event after another sensational day. The 2016 world champion produced a superb overtaking manoeuvre in the Winners’ Final of Elimination 5 to overtake then leader - Arnon Dagan (RRD / NeilPryde) - as the Italian struck for his second bullet in 3 races, before claiming 2nd in Elimination 6 to open up an 8.7 point lead. Iachino’s performance up to now has been nothing short of exceptional - qualifying for every Winners’ Final and only finishing outside the top 3 once in that time. That means after 6 eliminations Iachino holds counting results of 1st, 1st, 2nd, 2nd and a 3rd. Antoine Albeau remains in second place. AA was eliminated from Elimination 5 in the quarterfinals after a very uncharacteristic set of blunders in Heat 12, which saw the 24-time world champion drop an unheard of 3 out of the 4 gybes. Albeau then rode his luck to make the Winners’ Final of Elimination 6, but took full advantage of that luck by sealing his 3rd bullet of the event. Having failed to make it past the quarterfinal stage in any of the first 3 races here - Ross Williams (Tabou / GA Sails / Shamals Sunglasses) - has produced a miraculous recovery since then. The Brit qualified for his first Winners’ Final of the week yesterday where he finished 6th, while he was bang on the money again today as he qualified for both WInners’ Finals. At the end of Day 2 Williams was ranked 24th, but after digging deep, when it could’ve been easy to throw in the towel, and finding a renewal in confidence and seemingly rediscovering his speed the 38-year-old has broken back into the top 10 - 8th at the close of day 4. Jordy Vonk (Fanatic / NorthSails) remains in the top 10 - 9th - but had a day to forget after two quarterfinal exits. The second of which came in Heat 9 of Elimination 6, which saw 6 out of the sailors disqualified for premature starts. Elsewhere, Malte Reuscher (Fanatic / NorthSails) moves into 11th place from 20th after performing brilliantly in the howling winds - finishing 10th and 5th today, while Bruno Martini (RRD / Point-7 / AL360) enjoyed his best day of the season after securing 5th place in Elimination 5, and 14th in Elimination 6. However, things could’ve been a lot better as the Italian was leading the semifinal of race 6 before dropping his gybe and then was extremely unlucky to suffer a broken mast just minutes before the b-final. There are plenty of positives for the 24-year-old to take out of today. Diony Guadagnino (AHD / Loftsails) qualified for his first Winners’ Final of the event today after knocking on the door in the prior days. The Venezuelan claimed 6th in Elimination 5, while Sebastian Koerdel (Starboard / GA Sails) also booked his place in Heat 16 for the first time in Portugal. The wind and waves look set to continue tomorrow and based on the current WindGuru forecast the wind could easily each in excess of 40 knots again in the gusts, while the swell period and size is expected to increase as well. If tomorrow proves to be anything like today then it promises to be an absolute corker and you’ll be able to see it all live by tuning into www.pwaworldtour.com.